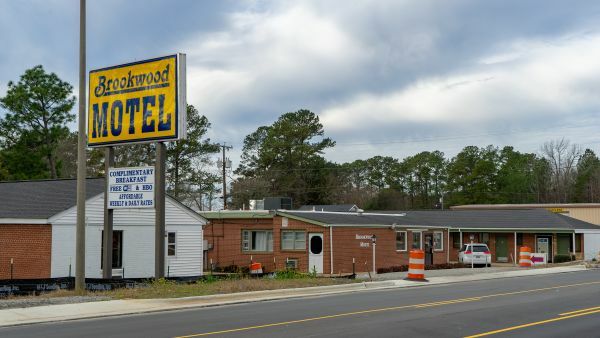 Located off Interstate 95 at Roanoke Rapids, North Carolina, this motel includes free WiFi access. It's 4.7 km from Roanoke Canal Museum and Trail. A flat-screen cable TV comes standard in each area at Brookwood Motel. Other amenities include a telephone, free toiletries, and air conditioning. A 24-hour reception is available to guests in Brookwood Motel. Other amenities offered at the property include laundry facilities, a vending machine, and also free parking. Carolina Crossroads Entertainment Complex, which includes a theater, is 9 minutes' drive from the motel. Guests will be 650 meters from Halifax Regional Medical Center.